Warkworth’s population of 4000 is estimated to reach 27 000 in the next 30 years. Without relentless optimism, on the strength of international experience Warkworth-as-a-satellite-growth-centre is a recipe for a sprawling, Geography of Nowhere town, totally dominated by cars. Satellite towns were devised as a solution to England’s huddled masses, and produced wholesome, compact towns where workers could readily travel to their workplaces, by train. Where the same thing was attempted without rail, but with motorways, they have been a disaster. They became towns that gobbled up farmland and were too spread-out to be walkable. Reliant as most inhabitants were on cars to get about, the streets were not safe for walking and cycling. It will require local leadership, imagination, vision, vigilance, skill and hard work to ensure that as it grows, it maintains its essential and unique qualities whilst discovering new and exciting possibilities for community building, environmental enhancement and economic development. 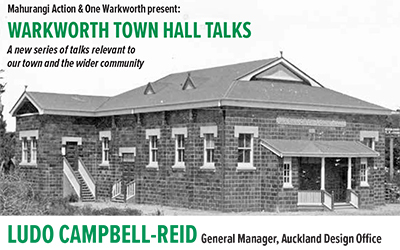 The Warkworth Town Hall Talks were conceived as an iconic means of empowering the Mahurangi community in the shaping of its explosive growth. Fittingly, the first talk, by Auckland Council’s principal cultural heritage specialist Robert Brassey, was on the archaeology of the region’s first European settlement, which was in the Mahurangi Harbour. The obvious earlier point to begin the talks, chronologically, would have been an account of pre-European settlement, or indeed an account of the continent of Zealandia’s remarkably atypical rise and fall, but these meaty subjects will be tackled, as speakers can be identified and tied down. The next town-hall talk will be on a subject directly linked to Warkworth’s rapacious growth: the watershed. In 1994, a series of studies of the benthic communities began, to benchmark the state of a number of estuaries in the Auckland region that were yet to experience significant urban development. Fortunately for the Mahurangi, its harbour was included. Unfortunately, the picture for its waters was as dire as it was unexpected—for a landscape widely regarded as exceptionally scenic. The harbour was going to hell in a handcart, due, it was believed, to an elevated sediment accumulation rate. After 10 years of measurements, with some species—notably cockles—failing to breed at all in some of the areas studied, the then Auckland Regional Council decided it was time for action. A sixfold increase in population represents significant urban development, by any definition, so now the pressure is well and truly on to build on the work initiated in 2004 by the regional council, in response to the 10 years of benthic studies it had presided over. The response included working closely with the community, which pulled the council, along with the Rodney District Council, towards the holistic approach encapsulated in the Mahurangi Action Plan: A Catchment Plan 2010–2030 . Fresh young combatants are rising to the challenge by forming a watershed team to step up the monitoring of the impacts of development. 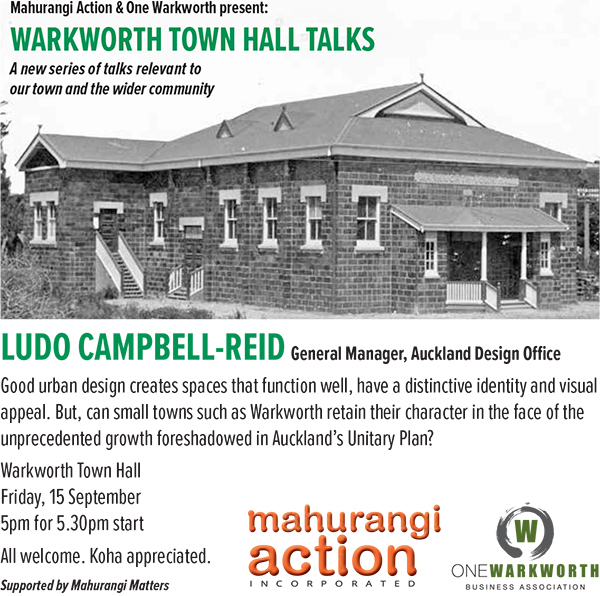 But that is October, and next Fridays talk, by ex-Londoner-but-now-unapologetic-Aucklander, urbanist Ludo Campbell-Reid, titled Unlocking the Magic of Places: An Impossible Dream for Warkworth, will likely be talked about by future urbanists as when the prospects for Mahurangi’s tidehead town went from same-old-same-old car-centric and unwalkable to 21st century. Warkworth Town Hall, 5 for 5.30 pm Friday 15 September! Warkworth’s current population of 4 000 is estimated to reach 27 000 people in the next 30 years. This scale and pace of transformation is unprecedented in its history and effectively means Warkworth will become both a destination for a growing sub-regional population as well as home to a larger local resident population that needs quality homes, entertainment, jobs, retail, schools and health services. As it becomes more populous, it will become more diverse, intense and complex in both form and function. Change is inevitable. What is not inevitable however, is the quality of that change. It will require local leadership, imagination, vision, vigilance, skill and hard work to ensure that as it grows, it maintains its essential and unique qualities whilst discovering new and exciting possibilities for community building, environmental enhancement and economic development. 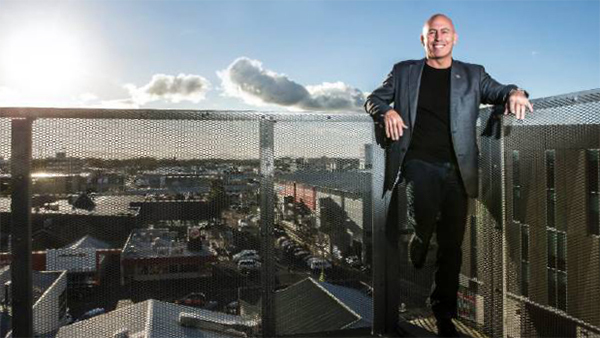 Join Ludo Campbell-Reid council’s Design Champion for Auckland as he shares his experience and ideas in international placemaking and how they might be applied to realising an impossible dream for Warkworth.